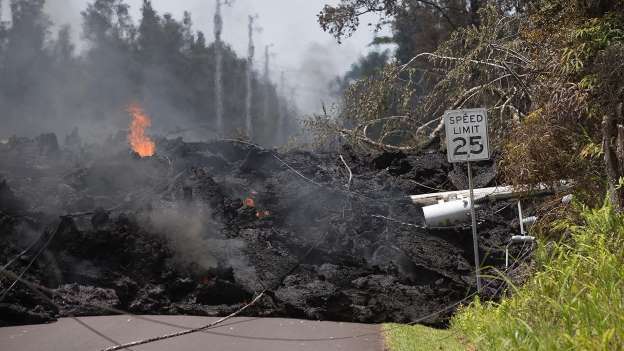 Residents on Hawaii’s Big Island were ordered to evacuate Tuesday as two new “highly active” lava fissures opened up in the community of Lanipuna. Locals received an emergency alert on their cell phones as government officials warned of danger in Lanipuna Gardens, a smaller division of Leilani Estates where lava has destroyed dozens of homes, near the town of Pahoa. “All Lanipuna residents must evacuate now,” the Hawaii Emergency Management Agency tweeted. Two volcanic vents are “actively erupting” and “Hazardous fumes continue to be released,” officials said. Residents were told to seek shelter at the Pahoa and Keaau Community Centers. Stacey Brix, a Washington state native who moved to the Pahoa area 14 years ago said officials shouldn’t have let residents back into the area if it wasn’t safe. President Trump announced on Tuesday Hawaii will receive federal disaster assistance for local recovery efforts regarding storms, floods, landslides and mudslides the state saw from April 13 to April 16. Hawaii Gov. David Ige said he’s contacted on the White House and the Federal Emergency Management Agency (FEMA) to tell them he believes the Aloha state will need federal help because of the recent lava as well.